Today we celebrate. Today we remember. Today we grieve. This is the day, two years ago, when Jody received his new recycled lungs. Two years!?!? Has it really been that long already?! This time has passed quickly, yet for Jody’s donor family it must feel like an eternity. It’s been two. long. years. since they hugged, kissed, laughed, cried and spent time with their loved one. How they must ache for a day, an hour, or even a moment more. We couldn’t possibly get through this day without thinking of this family and grieving with them over a life gone too soon. I hold onto hope that someday we will have the opportunity to meet or communicate with this family, to let them listen to Jody’s their loved one’s lungs, and to learn more about the person who gave him life. Until that day, when our donor family is ready, be it one month or five years, we will honor them and wait with heavy hearts as we remember their ultimate sacrifice. I’d like to think that somewhere on the East Coast this donor family is thinking of us today too. I bet they’re wondering how Jody is doing, or rather, how the lungs are doing. The truth is… they are functioning fantastically! Honestly, we couldn’t have imagined it so well, and really don’t understand how it’s even possible (apart from Divine intervention). Two years ago we were tangled in the chains of Jody’s old lungs, living under the dictatorship of Cystic Fibrosis and spending so.much.time. in the hospital. Jody’s new lungs have broken those chains and brought freedom into our lives. Obviously there are still medications (lots and lots of medications), blood work, tests and doctors appointments but that pales in comparison to the way things were just two years back. Organ donation does powerful things, Jody is living proof! Today we remember Jody’s donor family who selflessly chose to give life in a painful time of death. We grieve for his donor and honor his/her memory. Today we also celebrate Jody’s profound courage and strength in the midst of a debilitating illness, death-defying surgery, and lengthy recovery. We celebrate his fight and incredible success. To God be the glory, great things He hath done! Now that this post is complete I’m going to take a few minutes to watch Jody’s transplant video and reminisce, won’t you join me? On this day, at this time (0845), one year ago, I sat at a table in the family waiting room of the cardiothoracic surgical ICU at Johns Hopkins Hospital. It had been a whirlwind of events over the previous 36 hours and I had finally gotten some sleep and was ready to share the story of Jody’s double-lung transplant. I remember feeling such a sense of hope and wonder as well as gratitude and grief. My heart ached for the family who suddenly mourned the loss of life, a family to which I felt instantly connected through organ donation. Tears flowed as I typed and they have continued to flow throughout this first year following Jody’s transplant. Sometimes the tears come when I’m driving alone and thinking of the donor family or thanking God for Jody’s gift of health. Often they come when I’m watching Jody do something I know he couldn’t have done a year ago, like jumping off a diving board and swimming the entire length of a pool, or racing our girls in the yard, or even snow blowing our driveway in the freezing cold. The other week I watched him play a Frisbee game with his friends, running back and forth, effortlessly and free of an oxygen tank, and again my eyes began to water. I’m so very grateful and no amount of words can adequately express what I feel in my heart. It is so hard for me to believe it has been one year since Jody’s surgery. I remember it like it was yesterday and the entire experience has filled my thoughts so much this past year, sometimes more than I would have liked. It was such a life altering experience, filled with highs and lows, non of which could be too quickly forgotten. Jody, on the other hand, remembers very little details about his time in the hospital which is probably a blessing. I’m glad he can’t remember how miserable he was with that breathing tube down his throat. I’m glad he doesn’t know all the silly things he said and did while experiencing hallucinations as a side effect of his medication. I’m so glad he can’t remember what it was like to have his oxygen sats drop to the 60’s and not be given oxygen because it would be “toxic” to his new lungs (just watching it was scary enough). I’m glad he doesn’t remember when he felt like giving up. But I remember. When I look at photos of Jody’s transplant I can’t see the picture as you would, I have a memory and an emotion attached to it. You might simply see a picture of Jody and I together in the hall, smiling. I know, for instance, that the picture was taken after his return to the ICU when he could barely walk 50 feet (and had been walking two miles a day just a few days prior). I know that I took that picture when he needed to stop for a break during that 50 foot walk. The picture reminds me of how I felt when taking it. My mind is full of memories and especially in the first few months following transplant, normal conversations were hard. My husband had just had two vital organs removed and someone else’s organs put inside him, small talk just didn’t interest me. It seemed everything around me reminded me of transplant in some weird way and so it invaded my thoughts often in those first few months after returning home. Yesterday was just another day on this journey we call life, but it was a big, important day to me. It was one year since Jody’s surgery and it held so much meaning. He survived! I survived! We, as a family, survived! 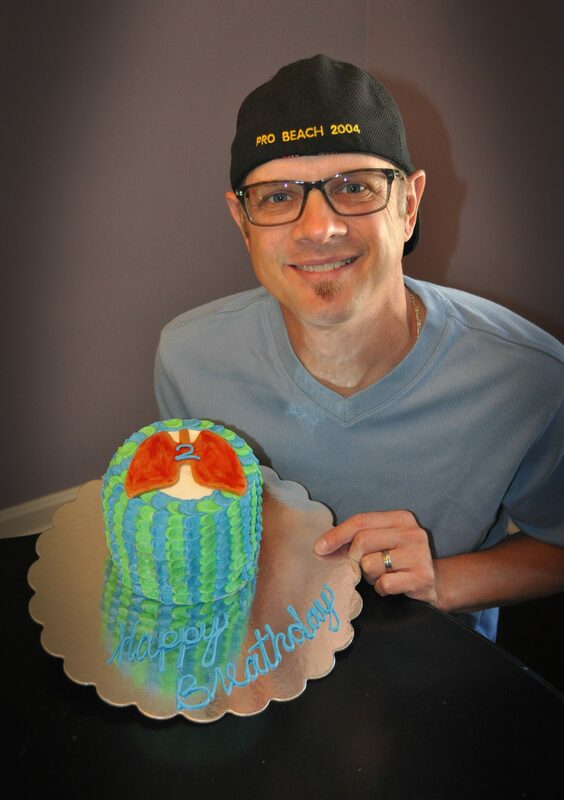 I remember writing the blog post Two (months) Down, Ten (months) to Go, referring to the 12 months the doctors say it takes to recover from a double-lung transplant, and thinking how far away that sounded. Jody was so weak and frail when he came home from the hospital. He was down to 100 pounds and it seemed like even the slightest touch hurt him. I couldn’t wait until I could hug him like normal again and not worry about hurting him or feeling every last one of his bones. God is good and Jody has made it through those first 12 months! In fact, not only is he living, he is thriving! 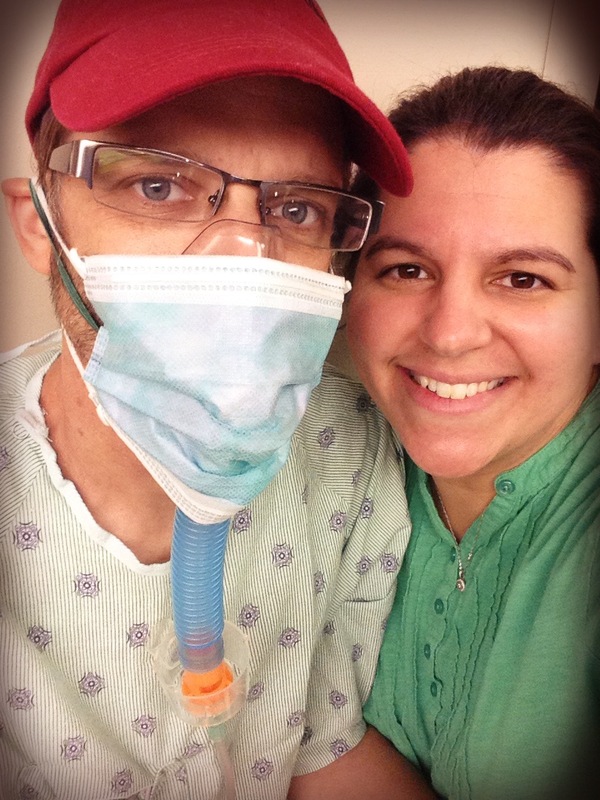 His lung function is better than it has ever been; yesterday he blew 105%! He was also told yesterday that he can stop checking his blood sugar because he hasn’t been requiring insulin and his post-transplant diabetes seems to have resolved (since he is on a lower dose of prednisone). His hemoglobin A1C, a measurement of the overall effectiveness of blood glucose control over a period of about three months, was 5.1 (the last time they checked it, it was 6.3 which was still higher than they wanted for him to be declared diabetic free). I remember in the early post-op days, Jody’s transplant coordinator talked about post-transplant diabetes and that “sometimes” people can get rid of it (although she didn’t sound very hopeful that that would be the case with Jody). I remember praying about it and have enjoyed watching his sugars improve with each tapering dose of his steroid. How awesome it is for this to be gone and what a 1st breathday gift! Hopkins will continue to check his level every six months, and we know it could come back, but for now we celebrate this small milestone and no more finger sticks for Jody. This past year has been a year of physical healing for Jody and emotional healing for me. I can honestly say there were times following transplant, particularly when I went back to work, where I felt like I was going to lose my mind. I was pulled in so many different directions caring for everyone and everything. I ran the house, cared for Jody, cared for our daughters, cared for my patients, and gave up many days off only to spend them at Johns Hopkins. I was exhausted, physically and emotionally. It was about that time I wrote this blog post. The good news is I pushed through. God strengthened me and slowly but surely Jody began to improve. He could look after himself and soon he was helping with our girls and doing small things around the house, like the post I wrote about how significant it was to watch him take out the trash. Today our lives are so different, not just from one year ago when Jody was recovering from surgery, but from two and three years ago when so much of our time revolved around illness and hospitalizations with Jody experiencing frequent lung infections resulting from his Cystic Fibrosis. I cannot believe we have gone an entire year without ANY hospitalizations!!! It’s so foreign to us but it’s good. Real good. I do not understand why God chooses to allow healing for some and not for others. I know many CF wives who have lost husbands, some before transplant and some after transplant. I don’t know how long God will allow Jody the health that he has right now but I praise Him for it. I recognize that Jody’s complete healing can only come Him. I also thank God for the healing He has begun in my heart and pray that He will help me to put my full trust in Him for my/our future, and not live a life of fear. This reflection of transplant has clearly been more my viewpoint than Jody’s (this is, after all, a blog about being a CF wife). I don’t make light of all that Jody endured because I know he took a beating; I witnessed it first hand. I remember so many times thinking to myself how strong and brave he is, and a true inspiration. Even in his darkest moments he didn’t give up (and there were a few times I know he wanted to). I’m so proud of Jody for the way he adheres to his post-transplant routine, full of medications, rehab (for the first six months), lab draws and self-monitoring. It has been pure joy to watch him blossom over this past year. I can’t imagine doing life with anyone but him. As I draw this post to a close I have a few things to share with you. 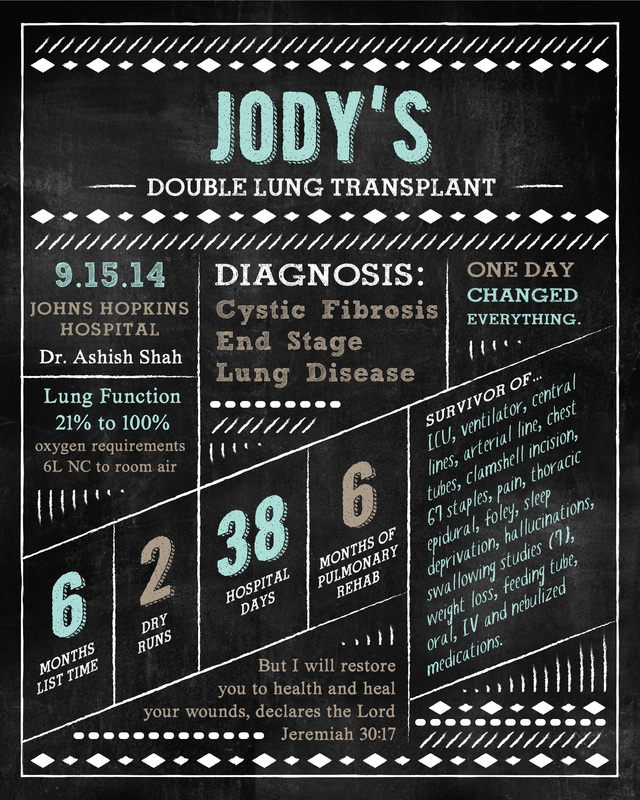 First is a video* I made where you can see for yourself the difference Jody’s new lungs have made. It’s a video of him doing his lung function tests before and after transplant. Jody has a hard time watching this video because he says it was one of the few times he felt defeated (giving it his all and it not being good enough). Before watching, take a deep breath and quickly blow out all your air… hold it for as long as you can. Did you cough? Did it make you short of breath? Watch Jody’s before and after, to see the difference transplant has made in his life. The second is a video* which you may have seen already since I posted it on our Jody Needs Lungs Facebook page yesterday. This is a video which reflects upon Jody’s five weeks in the hospital and his first year of recovery. Finally I’m sharing a few photos. *If you are an email subscriber you may have to visit my actual website to watch the above videos.